The Time app has a big Digital Clock, an Alarm Clock and Countdown Timer. 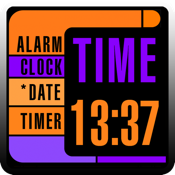 It displays the current time and date using futuristic graphics in one of 22 color themes. You can choose from 15 different sound fx for the alarms. Time is displayed in 12 hour or 24 hour versions. The alarm clock automatically resets to fire the next day after dismissal. There is a brightness dimmer with 5 different levels, which is really useful for dimming when sleeping. Be sure and check out the Quick Start Guide at the App13X.com site. Use the same email address if you have suggestions for new features, general feedback, or if you discover a bug in the app. Feedback is both welcome and encouraged. It helps me make the app as awesome as possible.